It was Cuckfield’s turn to travel the 0.9 miles to Ansty for their second encounter of the season. Ansty won the toss and buoyed by their performance the previous week, elected to bat first. Sussex pro Abi Sakande opened the bowling down the hill and took 3 wickets in his second over to leave the home side 10 for 3. James Thorpe then got in on the act, a sharp slip catch by Joe Ludlow to remove Chris Barnes. Ed Coombes and Sam Palser looked to rebuild and the pair added 30 before Thorpe nicked Coombes off for 22 and then trapped Palser (15) lbw reducing Ansty to 58 for 6. Nick Patterson picked up two wickets and Thorpe a fourth to leave the score 72 for 9. Glenn Anson joined Jake Wilson and the pair put on 25 runs taking the score to 97 before Anson attempted to put Sakande back over his head again and was caught by Thorpe for 20. Sakande took 4/29 and Thorpe 4/41. The Cuckfield reply was immediately blunted as they lost two quick wickets leaving the visitors 2 for 2. Brad Gayler joined Kiwi overseas player Jeet Raval and fight back commenced as Raval looked to take back the initiative. Raval’s score and the total both reached 41 before Gayler opened his account but it was an important partnership as the pair put on 62 for the third wicket. Gayler chopped on for 9, giving Wilson his second wicket and then quickly took a third. This brought Ben Candfield to the crease who looked to emulate Raval, hitting 18 from 13 balls before becoming Wilson’s fourth victim at 92 for 5. Raval made a quick-fire 58 before also succumbing to Wilson, but the damage had been done. Thorpe (4*) and Sakande (1*) saw Cuckfield home in the 17th over to win by 4 wickets. Cuckfield Cavaliers were on the road again as they travelled to Hurstpierpoint to play Hurst 1717 in the U19 Club T20. Cuckfield won the toss and elected to bowl first. Joe White and Matt Denyer opened the bowling once again as they kept things tight in the first three overs to put Hurst under pressure. This pressure showed when in the third over Akshaj Krishnan was run out for 4, by Ben John, trying to get to the striking end. White and Denyer were replaced by Lottie Palmer-Brown and Tom Black who both bowled good first overs, notably Tom Black bowling Ted Bloomfield for just 7 runs in his first over leaving Hurst 24/2 at the end of the power play. The Cavaliers continued to keep the runs down throughout the middle overs, with Black picking up his second wicket and also Palmer-Brown and Caidan picking up a wicket each. However, during the last 3 overs Hurst fought back to get to 105/6 off their 20 overs. Dom Sear and Ben John opened the batting for Cuckfield but the Cavaliers were set back in the first over by the dismissal of Sear for 1. This brought George Galbraith-Gibbons to the crease. He scored 32 runs in quick time before he was bowled by Bowden. Tom Morrissey came to the crease and he and Ben John did not mess around as they took it to the Hurst bowlers. The two never looked in doubt as they led the Cavaliers to victory by 8 wickets in the 11th over. Ben John hit 40 runs which included four fours and one six and Tom Morrissey hit 27 runs which included two fours and two sixes. Cuckfield’s next game is at home on Friday 21 July against Ifield Thunder as they look to make it four wins from four. Cuckfield won the toss at home and elected to bowl first. Buxted were quickly in trouble at 27 for 2, losing both openers for single figures to the bowling of Jamie Hutchings. Finn Coddington (23) and Sam Marchesi began to build a partnership, but this was broken by the left arm spin of Ed Catt as he clean bowled both. Another partnership began to develop between Gareth Clift and Marno Pretorius, but Hutchings dismissed Clift for 19 and then Catt took two more quick ones to leave the visitors 83 for 7. Chris Taylor just got in on the act with a wicket before Catt took another two to finish off the Buxted innings at 115 all out. Catt took 6/50 from 12.2 overs. The Cuckfield openers, James Mitchinson and Greg Wisdom put on 50 for the first wicket as Wisdom was caught off the bowling of Clift. A run out and two quick wickets for Harry Marchesi left Cuckfield 79 for 4, but Joe Cambridge (33*) and Taylor (21*) saw Cuckfield win by 6 wickets in the 24th over. Cuckfield won the toss away at The Field and put Poynings into bat. The move looked to have paid off as the home side quickly found themselves 3 wickets down, one each for Matt Denyer and Chris Osborne and a run out by Tom Morrissey. This brought Michael Prodger (51) and Keith Greenfield (61) together who frustrated the Cuckfield bowlers. 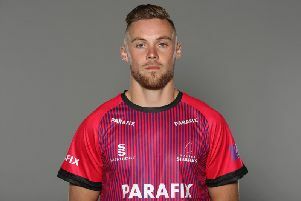 Cue an inspired bowling change by the stand-in captain, Goff Baker, to bring Will Rossiter into the attack. Rossiter removed both Prodger and Greenfield and then took 3 more quick wickets to leave Poynings 190 for 8 at the end of their 47 overs. Rossiter took 5/47. Rossiter and Morrissey opened for Cuckfield, but the Poynings opening attack of Andy Beal and Richard Brookes took early wickets and none of the Cuckfield batsmen were able to settle as wickets continued to fall regularly. Beal took 4/50, there were two wickets each for Brookes and Greenfield and one for Ben Toogood as Cuckfield batted out their 43 overs for 119, 9 wickets down. Cuckfield won the toss and asked Copthorne to bat first at Cuckfield Park. Jack Best removed the openers Adam Rowe (30) and Talha Khan (18) and then picked up a third wicket. The change bowling of Tommy Watson brought another leaving the visitors 4 down. The Copthorne middle order fired, however, with Abbas Zahid (42), Bradley Haupt (24) and Dan Konrad (34) all contributing. Watson, a run out by Will Rogers and Dan Tuner accounted for those three, but a late cameo of 20 not out from Tony Wilson helped Copthorne to 240 for 8 from their 47 overs. Best took 3/93 and Watson 3/62. Wilson then followed up his batting performance with three quick wickets as the Cuckfield top order crumbled to 50 for 6. This brought Cuckfield skipper, Glenn Smith, and Jack Best together and the pair launched a rear guard action stemming the flow of wickets. Paul Smart accounted for Best for 28, but Nathan Buckeridge joined Smith and played solidly while Smith tee’d off at the other end. Buckeridge became Wilson’s fourth victim for a well made 28, leaving Bryce Van Straaten (0*) to bat out for the draw. Smith made 61 out out in Cuckfield total of 188 for 8 from their 43 overs. Wilson took 4/43.